Suzy Khimm directs our attention today to the latest Gallup Poll about the rich and their taxes. Do they pay too much? Too little? The long-term trend is a pretty spectacular tribute to the power of repetition. After Bill Clinton raised taxes modestly on high earners in 1993, there was a big drop in the number of people who thought the rich paid too little in taxes. That makes sense. But take a look at the next two decades. Capital gains rates on the wealthy were cut in 1997 and the number went down again. 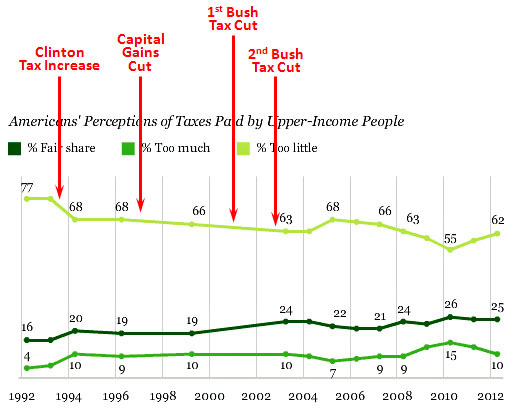 In 2001 Bush slashed their taxes and the number went down again. Bush slashed their taxes a second time and the number went down — again. The incomes of the rich skyrocketed during the aughts and the number went down yet more. By 2010, after two decades of skyrocketing incomes and ever-falling taxes, the number of people who think the rich don’t pay enough in taxes has dropped by over 20 points! That’s the power of the Republican message machine, and it’s pretty impressive. In the latest poll, the number finally went up a bit, and I imagine that shows the power of a countermessage. A combination of the continued recession, a louder and more unified Democratic Party, and the Occupy movement were probably responsible for the blip back up. Fighting back can make a difference after all.